Unless you’re broadcasting or commenting, you don’t really need the Periscope app anymore. Twitter is giving greater visibility to its live streaming app Periscope, with videos appearing directly in users’ feeds. Those videos will play automatically—though presumably without audio—straight from the timeline view in Twitter’s iOS app. Tapping on the video will open a full screen view of the Periscope stream, including hearts and comments from Periscope users in real time. Previously, tweets of Periscope streams merely included a link to the separate app. 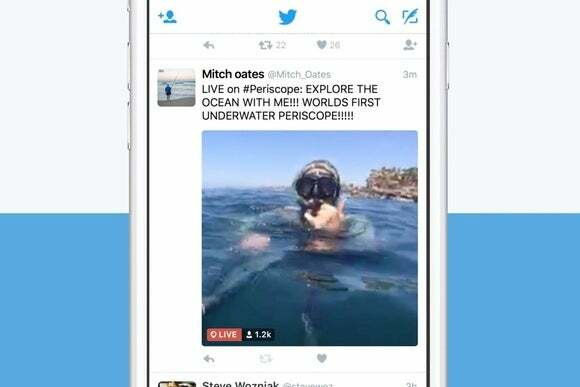 With videos embedded into Twitter, users can tune into live streams even if they haven’t installed Periscope. The Periscope app will still be necessary to comment on streams or host videos, and there’s no word on whether that’ll change in the future. Periscope embeds are rolling out over the next few days for iOS users. Support for Android and web versions will arrive “as soon as they’re ready,” Periscope says. Why this matters: The move is sure to boost usage of Periscope, which had 10 million accounts last August and has now hosted more than 100 million live broadcasts. But the auto-playing streams could also increase data usage from the Twitter app. It’s unclear if disabling auto-play videos in Twitter will prevent live streams from rolling, so users may want to keep an eye on how much data the app is using.